Since 1933, the Calder Memorial Trophy has been annually awarded to the NHL’s top rookie player as selected by the Professional Hockey Writers Association. Over the years, a number of players honored to receive this award have gone on to stellar NHL careers. Many have their names enshrined in the Hockey Hall of Fame. Among today’s active NHL players, such notables as Alex Ovechkin, Evgeni Malkin, Patrick Kane and Auston Matthews have taken home this trophy. For many of the former winners, the Calder Trophy became the only major NHL award they would receive. Most still had fine playing careers but would fall short of Hall of Fame recognition. Here’s a look at at several former Calder Winners since 1998, including the year they won the award and what they’re doing today. Andrew Raycroft, goaltender (2003-04). Though Raycroft appeared in 21 games over three previous seasons with the Boston Bruins, it was his 57-game performance in ’03-’04 that was considered his actual rookie campaign. He sported a record of 29 wins, 18 losses and 9 overtime defeats, with a 2.05 goals-against average and .926 save percentage. His rookie season was also Raycroft’s best as an NHL goalie. His performance declined as he bounced from the Bruins to the Toronto Maple Leafs, Colorado Avalanche, Vancouver Canucks and Dallas Stars. He subsequently spent two seasons in Europe before retiring in 2014. Today, he’s a volunteer goaltending coach with the University of Connecticut men’s hockey team and has appeared as a studio hockey analyst for NESN. Barrett Jackman, defenseman (2002-03). A solid defensive blueliner, Jackman narrowly beat out Detroit’s Henrik Zetterberg and Columbus’ Rick Nash for the Calder. Jackman spent all but one of his 14 NHL seasons with the St. Louis Blues, finishing his career with the Nashville Predators in 2015-16. In 2017, he returned to the Blues as a development coach. 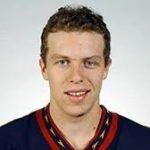 Dany Heatley, left wing (2001-02). A 26-goal, 67-point performance with the Atlanta Thrashers earned Heatley the Calder. His career was nearly derailed following a car crash in Sept. 2003 that killed teammate Dan Snyder. He pleaded guilty to second-degree vehicular homicide and received three years probation as part of his plea deal. Dealt to Ottawa in 2005, Heatley enjoyed his best NHL seasons with the Senators, including two straight 50-goal performances in 2005-06 and 2006-07. Traded to the San Jose Sharks in 2009, his performance began to decline. Following three seasons with the Minnesota Wild and a brief stop with the Anaheim Ducks, he finished his pro career in Germany in 2015-16. Heatley’s been out of the spotlight since then. In 2017, a Calgary court awarded him $6.5-million in damages after companies run by his former agent defrauded him of over $11 million in bad real estate investments. Evgeni Nabokov, goaltender (2000-01). In his first full NHL season with the Sharks, Nabokov sported a record of 32 wins, 21 losses and 7 overtime defeats, with a 2.19 GAA, .915 SP and six shutouts. Nabokov spent 10 seasons with the Sharks, establishing himself among the league’s best goalies. With the Sharks unable to re-sign him for salary-cap reasons, he spent the 2010-11 season in the KHL. He returned to the NHL in 2011-12, going on to play three seasons with the New York Islanders and one with the Tampa Bay Lightning before retiring in 2015. Nabokov returned to the Sharks in the fall of 2015 as their goaltending development coach and special assignments scout. It’s a role he continues to fill today. Scott Gomez, center/winger (1999-2000). The native of Anchorage, Alaska had a memorable NHL debut season, winning the Calder Trophy thanks to his 70-point performance. He was also part of the Devils’ Stanley Cup championship run in 2000. Gomez enjoyed his best seasons during his initial seven-year tenure with the Devils, helping them win another Cup in 2003 and posting a career-high 84-points in 2005-06. He went on to spend two seasons with the New York Rangers and three with the Montreal Canadiens but never again enjoyed the level of success as he did earlier in his career. From 2012-13 to 2015-16, Gomez played for the Sharks, Florida Panthers, Blues and Senators, including a one-season return with the Devils in 2014-15. Retiring in 2016, Gomez was hired as an assistant coach in 2017 by the New York Islanders, a role he still holds despite the recent changes among the club’s coaching staff. Chris Drury, center (1998-99) A 20-goal, 44-point performance with the Colorado Avalanche garnered Drury rookie of the year honours. Following four seasons with the Avs (including a Stanley Cup championship in 2001), he was traded to the Calgary Flames in 2002. The following year, he was dealt to the Buffalo Sabres. Drury’s three seasons with the Sabres were his best, co-captaining them to two straight seasons with 110-or-more points (2005-06 and 2006-07), including two Eastern Conference Finals appearances. He went on to sign with the New York Rangers in 2007 and had two solid performances in 2007-08 and 2008-09. Injuries, however, began to take their toll. In 2011, Drury accepted a contract buyout and announced his retirement. In 2015, Drury joined the Rangers front office. Since 2016. he’s been an assistant general manager and was also named GM of their AHL affiliate in Hartford in 2017. Sergei Samsonov, winger (1997-98). Teammate Joe Thornton was the Bruins’ highly touted rookie that season but it was Samsonov who took home rookie of the year honors with 22 goals and 47 points. From 1997-98 to 2005-06, the skilled left winger enjoyed his best seasons with the Bruins. Those years included back-to-back seasons with 70-or-more points in 2000-01 and 2001-02. With the Bruins rebuilding in 2005-06, Samsonov was dealt to the Edmonton Oilers, tallying 15 points in 24 playoff games helping them reach the ’06 Stanley Cup Final. Over the next five seasons, he played for the Montreal Canadiens, Chicago Blackhawks, Carolina Hurricanes and Florida Panthers before retiring in 2011. In 2014, Samsonov rejoined to the Hurricanes in their scouting department. He’s now their director of forwards development. Nice read mr Lyle Spector Richardson! Thanks. I decided to go back 20 years. Berard (1997) just missed the cut. Among the winners of the past 10 years, only goalie Steve Mason has really failed to shine consistently since winning it in 2008-09 while with Columbus. The same might be said for D T yler Myers who won it in 2009-10 for Buffalo after posting a 46 pt season (11 goals), although he did rebound last season with a 36 pt effort. Ironically, both were with Winnipeg this past season, although Mason is now a UFA.